Eric Mival, the main music editor on “The Prisoner” is prepared to sell the Prisoner Music Bible he and fellow music editor, Robert Dearberg, wrote for their work on the series. This is due to Eric wanting to raise funds to develop a unique approach to teaching maths to early learners, which he has developed over the last five years. 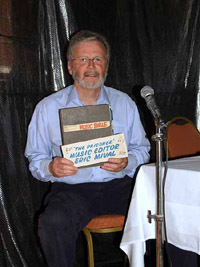 The Music Bible is the original black covered exercise book used to record all the details of music specially composed for “The Prisoner” along with library music that Eric and Bob selected mainly from Chappell’s music library. There is a small facsimile of it included with the Prisoner Original Soundtrack CD set released by Network DVD. However, the facsimile does not hold the unique notes about the library music. Beyond his days on “The Prisoner” Eric went on to write, direct, produce and edit a range of films, videos and DVDs for the BBC, Central Television, and a number of blue chip companies. More recently he has specialised in writing, directing and producing educational television programmes and videos for adults and children including the stories for Jolly Phonics, the leading synthetic phonics reading scheme. Anyone interested in wanting to help Eric’s latest venture by possibly buying this totally unique memory of “The Prisoner” please contact him by emailing him via our contacts page.